Hayling Island is an island off the south coast of England, nearPortsmouth. It has long been a hotbed of water sport / sailing activity, and now features a dedicated kitesurfing beach. Situated on the Seafront, opposite Chichester Avenue the site features parking right in front of the beach and has useful BKSA code of conduct signage. At low tide you’ll find large, waist deep, flat water lagoons, perfect for beginners or for freestyle/wakestyle tricks. Kite Beach will work on anything from E to W.
Kite Beach is rideable at an state of tide, but spring high tides, combined with the swell can result in a shore break which may be unsuitable for beginners. At low tide expect large, waist deep lagoons with flat water. 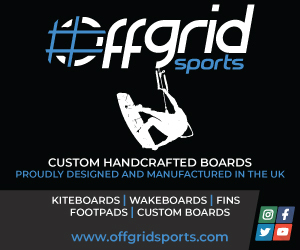 Perfect for learning or for freestyle/wakestyle tricks. At other tide states expect chop and small waves. Hayling Island has a BKSA code of conduct, which shows clearly where you should and shouldn't go. The zone markers on the beach (for walkers) are concreted into the beach, making them perfect for self launching from. This zone is away from the crowds and boasts a huge expanse of mostly empty beach and no groynes! There is a swim zone to the west marked by yellow buoys which you do need to stay out of. Kite Beach ~ Hayling Island from Mark Clark on Vimeo. At high tide the beach is steep, and can have a heavy shore break. Parking is right in front of the beach in a carpark, opposite Chichester Avenue, just off Sea Front. You do need to pay to park up to 6pm but for evening sessions it's free. I’m hoping at some point to get a decent feed into the site for weather, but until then here’s a link to 7 day wind forecast for Hayling Island. And if you’re wondering if it’s on right now, there’s the Met Office reading taken hourly. Many thanks to Mark Clark for proving the info for this guide.